[Review] BILLIE IDLE – Soshite, mata..
My thoughts on “Soshite, mata..”, the latest single from BILLIE IDLE. It doesn’t feel like its been that long since we had some new material for BILLIE IDLE but I suppose their album “NOT IDOL” (review here) did come out several months ago at this point. What a great album that was too by the way, with the addition of Pour Lui and the usual quality throwback songs BILLIE IDLE are known for combining to make for a fantastic release. I suppose that it probably came as no surprise that it ended up on my Top 10 Albums of 2018 list given all of those factors. “Soshite, mata..” is the latest offering from the…they’re not really a super group but you get what I mean. It’s a “one coin” deal in that it only costs 500 yen but with the drawback being it only has one song. I suppose that’s not the worst deal in the world considering I know there’s groups out there who would unashamedly ask double that price for a similar amount of content. No wonder Pour Lui isn’t making much money when she’s practically giving this stuff away, right? Speaking of Pour Lui, apparently she was responsible for the lyrics on this song. It was also apparently recorded at the same time as the “NOT IDOL” album so I guess they maybe didn’t think it was in keeping enough with the other songs to make the cut. It’s being billed as a song that can “show a different side to BILLIE IDLE than has been shown so far” after all. If that isn’t enough to scare you off then I suppose we’ll just get into it. Can’t promise this will be a long review but I’ve done quite a few of those in recent months so this should be a nice change of pace. 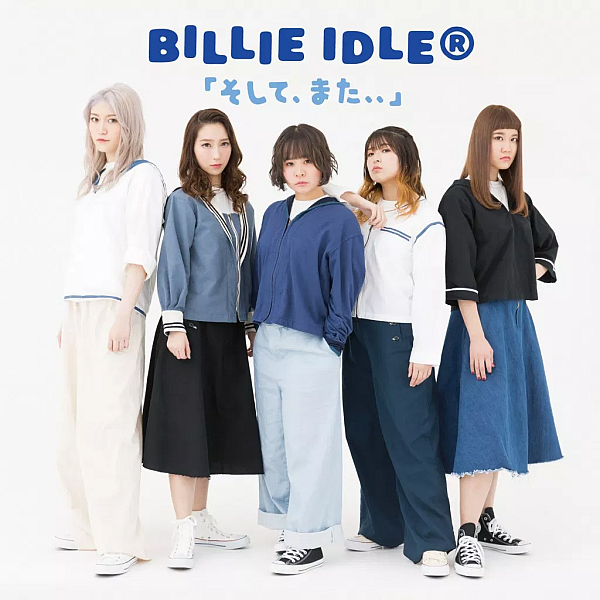 It doesn’t take very long to see what BILLIE IDLE were talking about when they said that this song would be showing a seldom seen side to the group. The instrumental opens with some rather beautiful piano playing and not the typical high energy Rock instrumentation that we’ve come to expect of late. This is supplemented by some fairly mild synthesizer until they bring in some guitar and drums to give things a bit more depth. The piano does fade a bit more into the background as the song progresses but it still plays a big role and helps cut through the guitar tones and consistent, reassuring drumbeat. This is not the uptempo, Punk Rock banger that you’re looking for but it’s still a really nice instrumental. If I didn’t already know that Pour Lui had a hand in the lyrics for this song I think I probably would have been able to figure it out fairly easily from just listening to how everything is laid out. This song definitely plays to her strengths, which if this was current era BiS might be a problem but because BILLIE IDLE has several vocalists who can also do this style of delivery it actually fits really well. We’re treated to some really smooth vocal tones that allow the members to showcase the lower end of their range as well, though still accented by some higher pitches when the need arises. The song is very emotional while also somehow being able to work in a rather catchy chorus so some old habits die hard on that front. It is still BILLIE IDLE after all. BILLIE IDLE definitely showed off a lot of new or seldom seen things on this single. While not being the style of song that many people, myself included, really go to this group to for it was still pretty cool to hear them tackle something like this. I don’t think people are silly enough to question the talents of each BILLIE IDLE member but if there was any doubt about how good they are vocally then this single should put that to bed. I kinda wish we got a b-side on this one honestly. We won’t have to wait too long for the next BILLIE IDLE single though, with their next one currently slated for a May release. It’s going to be interesting to see if they let Pour Lui loose on the lyrics for any other songs in the future as well. It seems like she brings something different to the table than what you’d normally get from BILLIE IDLE and I think that’s a positive.